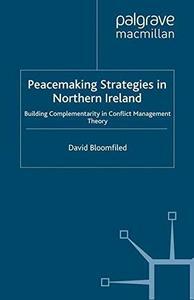 Peacemaking Strategies in Northern Ireland Building Complementarity in Conflict Management Theory | Free eBooks Download - EBOOKEE! Posted on 2018-11-07, by voska89. How can scholars develop better co-operation between competing theoretical approaches to conflict management? This study analyses real peacemaking strategies in Northern Ireland from 1969 to the present, including case-studies of the Brooke Initiative political talks and the Community Relations Council. In the light of this wealth of practical evidence, the theoretical debate is re-examined in order to develop a flexible and more inductive model of complementarity which can enable the best elements of all theoretical approaches to conflict management. No comments for "Peacemaking Strategies in Northern Ireland Building Complementarity in Conflict Management Theory".